Very often, business professionals approach presentations as something to get through without f*****g up. ‘Phew’ they will say internally, ‘I think I got away with that’. They prepare strong content, ensuring all the relevant points are made. Their focus is on WHAT to cover. They may also have ticked the boxes on HOW to cover it. The opportunity though is lost so often though because the WHY was never thought through. So that’s the What, How and Why…but still there is something missing. It’s all a bit dry isn’t it? Firstly, give your presentation a strong beginning. We always remember the first things in life don’t we? Or reinforce. Very often people assume that they should only say something once. No, no, no! Remember, part of your why is to get some form of action from your audience. If you don’t like the word ‘repeat’ then use the word ‘reinforce’. Reinforce is a strong word. Whether you use the word Repeat or Reinforce it is essential that you do it! Without this R word thoughts cannot form into actions. People need to hear things more than once. Whether it be marketing messages, advice from parents, teachers, learning lines for a play, all involve the need to repeat. Say something outstanding. The bauble on the Christmas tree. You don’t need many baubles – one or two. In fact the fewer you have the more outstanding it can be. Examples of something outstanding could be a story, an action (dance like no one’s watching! ), even a pause…try it. Pause for 5 seconds during your speech and see what effect it has on your audience. I bet they’ll remember it! No matter what you talk about, and no matter how creative you are in bringing outstanding images, make sure they are linked to your central theme. A good technique to link absolutely anything to your message is to go as BIG PICTURE as you can when drawing out the link or message. The great thing about this technique is that there are no rules as to how big you can go. As important as the ‘F’ or First in FROLL, everyone remembers the last thing you do or say. Be careful here. When does your presentation end: when you stop speaking? When you walk off the stage? When you meet the audience at the end of the session? Decide where the end is and drive towards it. The last thing to give is your Call to Action. What is it you want your audience to do as a result of what you have said, done and imagined? 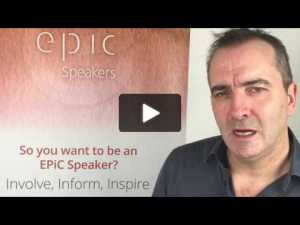 To find out more about how to be an EPiC leader, click here to arrange a conversation with one of our Consultants or call us on 00 44 (0)1932 888 885.